Frequently asked Question : What if nobody is home to receive the flowers? Please click here to see the free delivery areas. 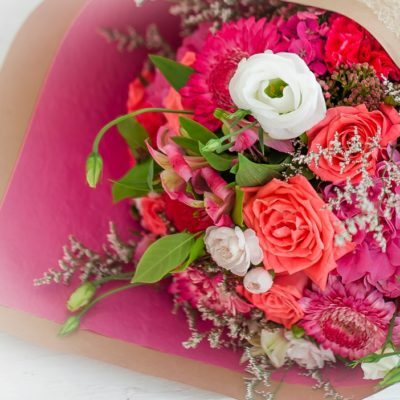 For out-of-area customers, please contact me if you would like to arrange for me to personally delivery or you are more than welcome to pick up the flowers from my address. 2) What floral designs will I get? Each week , the floral design will depend on what flowers are in season and available at the Auckland Flower auction. This ensures that your flowers will always be gorgeous and fresh. Please see my Floral Design Gallery for some examples of design styles and colours. 3) Do you do weddings, events and other special requests? For all inquiries, please contact me to discuss your floral requirements. 4) How do I care for my flowers? Most floral arrangements will last between 4-7 days . This is dependent on the types of flowers used and the level of care they receive. A sachet of flower food are provided with each bouquet. Fill a suitable clean vase with fresh tap water. Dissolve the contents of the sachet provided into the water. Re-cut stems on an angle with sharp clean garden scissors or knife. Remove any foliage that will be below the water line and place flowers into the prepared vase. Keep in a cool place away from drafts, direct sunlight, heat sources and bowls of fresh fruit. Check the water level in the vase/ water box daily, and add fresh water as required. Everyday remove any leaves that may have fallen into the water and any flowers that may have wilted . After 3 -5 days, carefully remove the good flowers, clean the vase thoroughly with soapy water to remove any bacteria that could cause the fresh flowers to deteriorate even quicker and rinse thoroughly. Refill the vase with fresh water. For best results, cut stems with a sharp clean garden scissors at an angle about one to two cm from the bottom. This allows them to better absorb water. Keep flowers in a cool spot, away from direct sunlight, heating or cooling vents and drafts. 5) How do flower order payments work? 6) What if nobody is home to receive the flowers? Your flower order is water-wrapped to keep your flowers fresh. The flowers will be placed close to, or near your front door in the most protected spot. You can give me any special instructions for your delivery at the Checkout page. If you have any questions that aren’t answered in the Frequently Asked Questions below, please don’t hesitate to email me at: sandra@harbourroseflorist.co.nz and I’ll be happy to help you further.